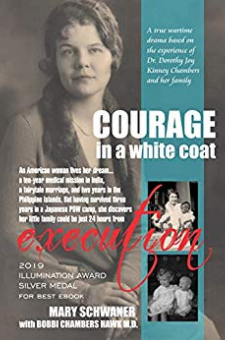 Prison camp, starvation, execution...all threaten her little family.A true wartime drama based on the experience of Dorothy Joy Kinney Chambers M.D. and her family.This sweeping biographical novel brings to life the dramatic experience of a valiant woman who, armed only with the white coat of her profession, found the courage to live her life on the razor’s edge and survived it. It’s a captivating story of service and sacrifice, of love and the searing emotions that gripped this missionary doctor throughout her imperiled course. . . . . . . . . . . . . . . . . . . . . . . . . . . . . . . . .“A lovely story of an extraordinary woman! The use of contemporary sources adds authenticity to an ordeal that could be overwhelming in its grimness were it not described so vividly and poetically.” —Dorey Schmidt, Ph.D. . . . . . . . . . . . . . . . . . . . . . . . . . . . . . . . .Dorothy Kinney had found herself in remote India in 1928, a medical missionary charged with building up a hospital for the women and children of Assam. The fledgling doctor began her practice in Gauhati, where her surgeries were performed by the light of a kerosene lamp in an open-air clinic with no electricity, no running water, and no sewer system. She left it ten years later a fully functioning modern hospital, with running water, electricity, and the complete devotion of the people of Assam.It was there she fell in love.Pregnant with their second child, Dorothy, her missionary husband Fred Chambers, and their daughter Carol Joy, set out on a voyage that would take them to their new missionary post in Iloilo, on the Philippine island of Panay. One day later War was declared in Europe.She could not know that by the time her unborn baby turned eighteen months old her little family would be swept into a Japanese internment camp. With four thousand other prisoners of war she struggled to feed her little family in the prison at Santo Tomas, a place where hundreds died and most starved. Had General MacArthur’s bold rescue not liberated them, the entire camp would have been lost.Many remember Dorothy Chambers in her white coat of courage, doctoring the children of the camp, never knowing that her little family would come within just twenty-four hours of execution.This is her story.